I have decided to continue for another year to select a word that I want to make more visible in my life. 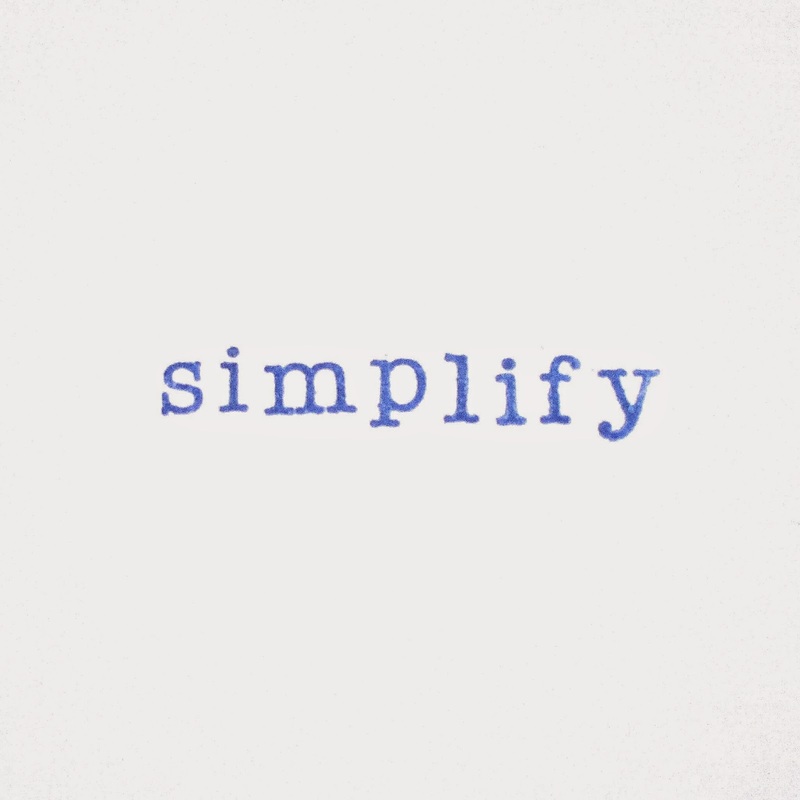 I've chosen SIMPLIFY as my One Little Word and I'm excited about what my new word will help me achieve this year. The words I've selected for the past few years have played a key role in shaping me as a person and my year ahead. GROW helped me find the things I love and to grow a new seed in my life. EMBRACE enabled me to deal emotionally during a challenging year, embrace the things going on, hold on tight and welcome in change. I'm hoping SIMPLIFY will help me to take a step forward with plans and get to the heart of what lights me up and makes me feel really happy. It's my third year of taking Ali Edward's One Little Word online class. I'm truly inspired by Ali's approach to this topic, her personal reflections, her style of memory keeping, how she goes about documenting life in photos and words, and how she tells her story. Take a look at this video where she explains so beautifully what her One Little Word class is all about. I'm so proud to be part of this tribe of women selecting a word and making it more visible in our lives. My word for this year arrived with a jolt last October. I sat down one Friday evening after a particularly challenging and overwhelming week at work and for the first time that week I stopped and relaxed, tried to clear my mind of work things, switch off from the week and just breathe. I don't know about you but when I'm busy or feeling a bit of pressure I forget to breathe deeply and properly. I had worked late and was sitting on the train home, I switched on some music and I took a deep breath and started to feel relaxed. As my brain ticked over the week I had the first chance to get some clarity, put work behind me and think about the weekend ahead. I realised that I hadn't planned what I was doing that weekend. I work Monday to Friday so my weekends are my time to shape and a time that I can be more me. The fact that I hadn't planned my weekend really upset me and I realised that something needed to change. For me weekends are a time when I get to spend quality time with Mr C, see friends, a time to dive into my hobbies, and get things done in our home. I sat on the train and I felt engulfed with things I wanted to do, felt that I should be doing, and realised that I should have sorted a few things during in the week to progress with things over the weekend. Something inside me kicked in and I thought...you just need to simplify your life. It was at that moment, I typed it into Evernote, and decided that SIMPLIFY would be my word for 2015. I realised that life seems to be filling up with lots of things, with work tasks, things to do at home, my hobbies and interests, things I want to read, relationships to nurture, and day to day stuff of life. Many of these aspects of my life have been feeling a little too complicated. I've had moments of feeling overwhelmed with things, so much so that I haven't been able to make a decision about what I wanted to do. I had lots of things I wanted to fit in but couldn't. I needed to simplify my thinking and have enough head space and time to do the things I enjoy most of all in life. I look back and perhaps my word started making an appearance even earlier in September last year when we moved house. At the time I was feeling quite engulfed with various things going on, a challenging time at work, and then moving house added to it. Moving house can be exciting but also quite emotional as you work through memorabilia and touch everything you own, through packing and unpacking. Seeing the stuff in my life made me see what I truly loved in my belongings and other things that I looked at and thought 'why do I still own this?'. As we moved and unpacked into our new space I started clearing things and mentally adding to a checklist all the things that I thought I should look at in more detail and pair down. I think this was also the start of the signal to me to simplify. I like the idea of keeping simplify at the heart of everything I do. I feel that it will hopefully be a transformative word and will give me space in my life to feel lighter and allow me space to move forwards. I'm looking to simplify my possessions, personal habits and routines, relationships and career. I'm looking to make some changes and to do and own things that I really love and want as part of my life. It will be a time when I will need to decide what to welcome in and what I will let go of. Behind it all I want to simplify, reduce the complexity, make things easier and have the space and time to do what I enjoy the most. For me it doesn't mean becoming a minimalist and having an empty home, just finding ways to simplify the way I do things. I'm looking forward to finding out how this word will help shape me and my life in the next year. I've been letting my word in gradually since October and it has been sitting well with me. During January I've been discovering what simplify means to me and thinking about my intentions for the year. I've already looked to my word over the past few weeks when I needed guidance of what to do with a few complex situations going on. Simplify has helped me reach decisions and conclusions, allowing me to move forward and simplify. Simplify has already signalled to me to take a step back, only welcome in what I truly want, let go gracefully of things not meant for me, and to allow space for other things to come into my life that will make me even happier. I hope you'll join me here this year and see how simplify will be making an impact on my life.